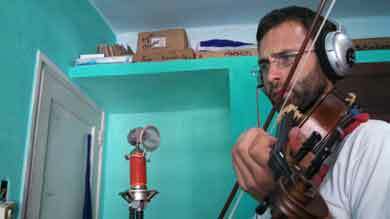 CLLAS graduate grantee Charlie Hankin, a music major, recorded violin tracks for raperos in Havana while carrying out ethnographic research. Havana is often described as a time capsule: 1950s cars, crumbling buildings, and a relative absence of international monopolies. For me, it’s another type of time capsule. Studying at the University of Havana in 2009 was by far the most significant and influential event of my life. Having the opportunity to return there this past summer reinvigorated my fascination with Cuban culture. I spent the month of August carrying out an ethnographic study of hip hop in Havana. My interviews took me from the peripheral neighborhood of La Lisa in southwestern Havana to the distant municipality of Guanabacoa in East Havana. The artists with whom I spoke see hip hop culture as community activism, pacifism, and pedagogy. Rap is nonviolent protest music that allows artists to delve into themes that might otherwise be off limits. Most raperos in Havana told me hip hop changed their life: “Hip hop, more than a genre, is a way of life. […] Our lives changed when we approached hip hop. For the spirituality, the vibes, the humanity and family that are breathed at a hip hop peña. It’s different from any other genre. You might enjoy something musically, but you don’t feel the same union. Hip hop makes you grow as a person.” Equally striking: “This is our little piece of modern identity.” On an island isolated from cosmopolitan culture by the US economic embargo and internal restrictions, hip hop allows artists to interact with modernity. I had the opportunity to experience the community fostered by hip hop culture by attending “underground” concerts (peñas) and collaborating with three of the most important producers in Havana, recording violin tracks for raperos. A thrilling opportunity, recording was also a wonderful way to address the oft-encountered problem of reciprocity in ethnographic fieldwork. In addition to carrying out interviews and collaborations, I attended the tenth annual International Hip Hop Symposium, an official event of the Cuban Rap Agency. In the 1990s and 2000s, Cuban hip hop served as a vanguard for Latin American hip hop culture and gained international recognition. An international festival was held annually in Alamar, East Havana that attracted even significant North American artists such as Dead Prez, Black Star, The Roots, Common, and Mos Def. The group Orishas put Cuban hip hop on the world stage in 1999 with the album A lo cubano, mixing rap with Cuban son, but Orishas left Cuba to tour in Europe in the late 1990s and remained there. Hip hop in Havana is currently in a precarious state, suffering from the absence of another significant group, the “underground” duo Aldeanos, who recently emigrated to Miami. Aldeanos brought rap lyrics to a level of outspoken criticism against the government and attracted a wide audience. As a rapera I interviewed explained, “They began to write lyrics that no one else was brave enough to say.” But living in the United States, Aldeanos cannot maintain the same discourse of socially relevant lyrics with Cubans. Despite what I’ve dubbed the “Cuban hip hop diaspora” and difficulties of being an independent musician in Cuba—threats of censorship, economic hardships, high cost of recording, scarcity of internet, inability to promote oneself, lack of media coverage for hip hop—artists there continue to grow and evolve. Raperos and producers are beginning to experiment with a more “Cuban” sound, departing from the North American beats they have tried to emulate during the past two decades. They are also looking to make hip hop more accessible: to address more universal themes with more danceable musical backgrounds. A competitive youth hip hop festival began two years ago called “Creciendo en el hip hop” (Growing in hip hop). I predict that the talented and motivated young teenagers that make up the newest “Nueva Escuela” (New School) will learn from the suggestions and difficulties of their predecessors and recover a space where hip hop can thrive in Cuba. But it will perhaps never again be truly “underground,” as raperos and producers increasingly search for ways to make money as artists and avoid being viewed solely as dissidents. We really can’t blame them.